Congratulations to Summer R. Nichols on opening her new office in Jacksonville. Summer recently relocated to Florida's first coast, bringing the highest quality family law legal services with her. 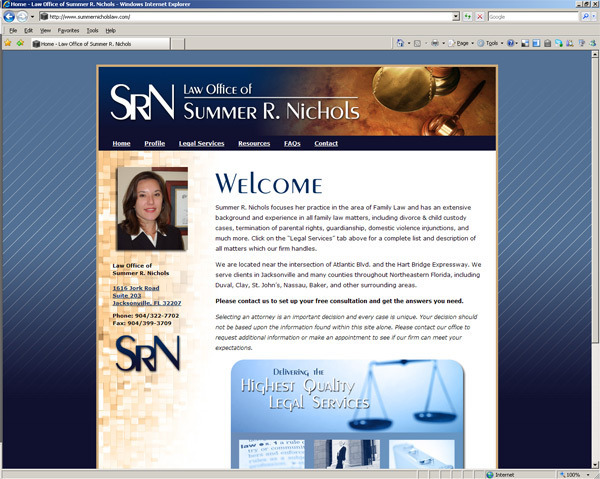 Since the Law Offices John C. Kenny, Esquire is Of Counsel for the Law Office of Summer R. Nichols, Summer asked that the design of her new logo and brand have a similar aesthetic to John's. As such, I incorporated the same font in her monogram and a complimentary color scheme on her website, while still providing Summer's new practice a look and feel all its own.